The Desert Foot 2018 Multi-Disciplinary Limb Salvage Conference convened in Phoenix again this year, focusing on new technology for the care and preservation of the lower extremity. The event comprised four days of cutting-edge lectures, 17 hands-on workshops, and an abundance of industry events. Conference Co-Chairman Charles Andersen, MD, Lawrence Lavery, DPM, MPH and Lee Rogers, DPM led an esteemed faculty of 52 clinicians and researchers, educating hundreds of clinicians from around the country. 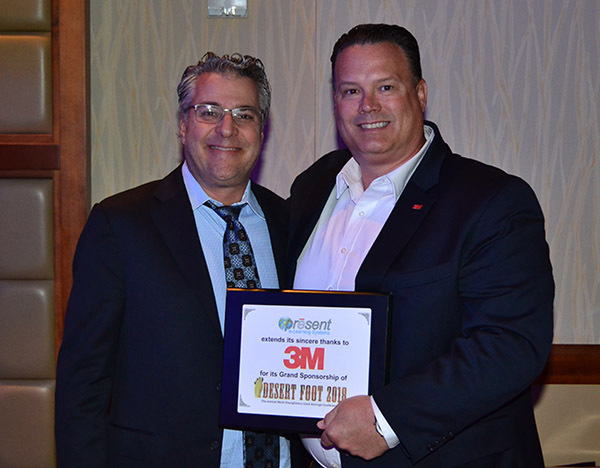 Derek Hughes of 3M was honored as the Grand Sponsor of PRESENT Education for 2018. 3M's generous support allows PRESENT e-Learning Systems to deliver the PRESENT Residency Education Online weekly curriculum to hundreds more podiatric residents across the country. Derek Hughes of 3M accepts the Grand Sponsorship Award from Michael Shore, Director of Medical Education and Founding Member of PRESENT e-Learning Systems. 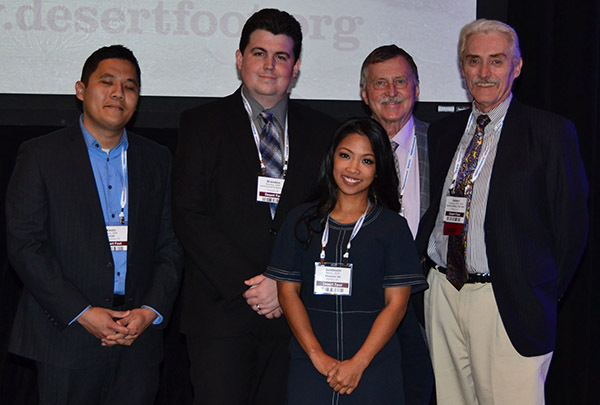 The winners of the Desert Foot 2018 Abstract/Poster Competition were Jaminelli Banks, DPM for her study, “Use of Remote Temperature Monitoring to Identify Pre-Ulcerative Lesions for DFU Prevention and Early Detection: A Case Series of Four Patients” in the Resident category, and Paul Savage, DPM for his study, “Evaluation of Ceragenin CSA-44 for Acceleration of Healing of Chronic Wounds Associated with Type 2 Diabetes” in the Non-Resident category. 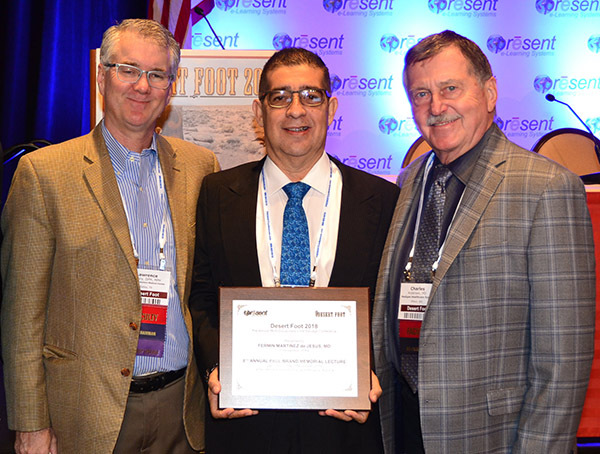 The winner of the 2018 Paul Brand Award for excellence in limb salvage leadership is esteemed general surgeon, Fermin Rafael Martinez de Jesus, MD of Mexico City, Mexico. Click below to see more images from this year's Desert Foot Conference. Next year’s Desert Foot Conference will take place Dec 4-7, 2019 at the Sheraton Grand Phoenix, in Arizona. Make your plans today to attend PRESENT Treasure Hunt at the Hotel Indigo in Los Angeles, CA on January 26-27, 2019. Be the first to comment on this topic!